Best Buy Earnings: Is the Electronics Giant Finally Back? After reporting a great third quarter, does the electronics retailer have its mojo back going into the holiday season? On Thursday, Best Buy (NYSE:BBY) delighted fans and investors by reporting a blowout fiscal third quarter. The results, reported before the bell, were non-GAAP diluted EPS at $0.32 per share versus analyst expectations of $0.25 per share. And while total revenue growth was still sluggish at 0.6% over last year's quarter, that figure also beat analyst expectations by coming in at $9.38 billion versus $9.11 billion. More importantly, the company appears to have found an in-store strategy. Domestic comparable sales increased 2.4% ex reclassifications, signaling it's finding a way to use its stores as an advantage against online retailers. And speaking of online retailers, Best Buy increased its domestic online revenue an outstanding 21.6% over the same quarter a year ago. Although online is still a small portion of the total revenue haul, it is encouraging to see Best Buy growing this segment instead of conceding this channel to other retailers. Great quarter, but is it sustainable? 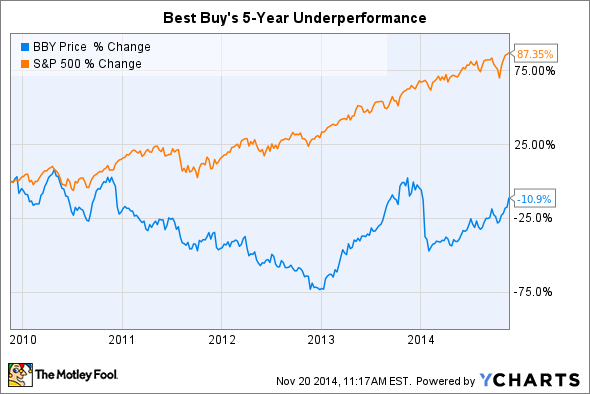 Over the last five years, Best Buy has had a tough time. The company found itself a victim of the macroeconomic environment and suffered during the recession. However, unlike other retailers, the company never recovered post-recession. The chart below will give you proper context of Best Buy's struggles versus the greater S&P 500. The company faces two problems: aggressive pricing competition and the discretionary nature of their products. Due to Best Buy's large store footprint (read: costs), the company would find itself losing a pricing war to online retailers -- mostly Amazon.com. The trend of shoppers coming into Best Buy stores to test products then buy them from online retailers was so prevalent it inspired its own name: showrooming. CEO Hubert Joly has instituted price-matching strategies and improvements to counteract this trend and it appears to be paying off. The second issue is the discretionary nature of Best Buy's products. Unlike a grocer or a discount retailer like Target, consumers generally can postpone electronics purchases until they are more comfortable about the overall economy and their personal finance situation. And although the recession is over, wage growth is still harder to come by. Many were left scarred by the recession and have closed their pocketbooks. In addition, the recession has been tough for technology savvy millennials that are a natural fit for Best Buy's brand. However, more recently, price drops in oil and slowing healthcare inflation have given many Americans a stealth pay increase. The consumer confidence index is sharply up and generally portends more discretionary spending, which is good news for Best Buy going into its seasonally heavy fourth fiscal quarter. There's been a host of positive economic news -- GDP grew at a 3.5%-plus annualized rate the past two quarters, there have been nine straight months of 200,000 jobs created, and an unemployment rate below 6% -- that will eventually lead to more discretionary spending. And when that happens, a leaner, better-ran Best Buy will be in a position to benefit from it.